Drawbridge (formerly Saline City) is a ghost town with an abandoned railroad station located at the southern end of the San Francisco Bay on Station Island, now a part of the city of Fremont, California, United States. It is located on the Union Pacific Railroad 6 miles (10 km) south of downtown Fremont, at an elevation of 7 feet (2 m). Formerly used as a hunting village, it has been a ghost town since 1979 and is slowly sinking into the marshlands. It is now part of the Don Edwards San Francisco Bay Wildlife Refuge and is illegal to visit. Drawbridge was created by the narrow-gauge South Pacific Coast Railroad on Station Island in 1876 and consisted of one small cabin for the operator of the railroad's two drawbridges crossing Mud Slough and Coyote Creek to connect Newark with Alviso and San Jose. At one time 10 passenger trains stopped there per day, five going north and five going south. The drawbridges were removed long ago. The only path leading into Drawbridge is the Union Pacific Railroad track. In the 1880s, on weekends nearly 1,000 visitors flocked to the town. By the 1920s, although the town had no roads, it did have 90 buildings, and was divided into two neighborhoods: the predominantly Roman Catholic South Drawbridge, and the predominantly Protestant North Drawbridge. After the turn bridge drawbridges were removed and most of the residents had left, the San Jose Mercury News for years incorrectly reported that the town was a ghost town and that the residents left valuables behind. As a result, the people still living there had their homes vandalized. The town's last resident is said to have left in 1979, and Drawbridge is considered to be the San Francisco Bay Area's only ghost town. Drawbridge is now part of the Don Edwards San Francisco Bay National Wildlife Refuge and is no longer open to the public due to restoration efforts, though it can still briefly be viewed from Altamont Corridor Express, Capitol Corridor, and Coast Starlight trains. ^ a b "Drawbridge". Geographic Names Information System. United States Geological Survey. January 19, 1981. Retrieved September 21, 2018. ^ a b Durham, David L. (1998). California's Geographic Names: A Gazetteer of Historic and Modern Names of the State. Clovis, Calif.: Word Dancer Press. p. 625. ISBN 1-884995-14-4. ^ a b c d Jones, Carolyn (March 25, 2010). "Ghost town of Drawbridge is going down into bay". SFGate. Retrieved September 21, 2018. ^ Cite error: The named reference http://sfbws.com/drawbridge was invoked but never defined (see the help page). ^ "Drawbridge, CA: Returning the Tide" (PDF). United States Fish and Wildlife Service. September 2003. Archived from the original (PDF) on April 23, 2007. Retrieved September 21, 2018. ^ Steiner, John (2003). "Drawbridge: A Ghost Town Revisited" (PDF). Don Edwards San Francisco Bay National Wildlife Refuge. Archived from the original (PDF) on October 12, 2006. Retrieved September 21, 2018. Barry, Shannon (August 15, 2012). "Fading History: Forgotten town of Drawbridge is slowly sinking into the South Bay marsh". Milpitas Post. Archived from the original on March 26, 2016. Retrieved September 21, 2018. 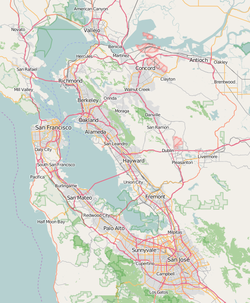 Wikimedia Commons has media related to Drawbridge, California.